Balanced. Harmonious. Refined. Transitional kitchen design is a great way to bridge traditional style with contemporary sophistication. If your personal taste doesn’t quite match traditional embellishments, or if contemporary design seems too stark for you, transitional design may be the perfect fit for your home. A transitional look combines the comforts of classic décor with the simplistic lines of ultramodern design. Here are a few features that will help bring a cohesive, yet blended, look to your Denver kitchen remodel. Warm, neutral colors bring softness to the space while allowing key features to stand out. In the kitchen, determine if you will use a paint or a stain on your Denver custom cabinet or semi-custom cabinet, and the rest of your color choices will fall into place. Because many cabinet manufacturers offer custom paint programs, color options are nearly limitless. To enhance your kitchen design even more, find interesting materials and textures when picking out your countertop and backsplash, such as glass, marble, wood, and stainless steel. Natural stone or glass countertops that can be lighted from underneath add a striking flair. Vary the tones and textures in the room while maintaining a cohesive color scheme throughout; add in just a few key components of color here and there to enhance the look. Simple lines and smooth details contribute to the comfort of a transitional space. Shaker-style cabinetry is suggested for its classic structure and streamlined construction. However, if this cabinet doorstyle is too plain for your tastes, additional detail accents such as decorative trim and turned legs can dress up the design. Open shelves or glass-front doors can also be incorporated to showcase dishware and moderate décor. Personal touches of decoration that represent your individual style will bring distinguished elements to the room. To achieve a balanced transitional design, mix clean, straight lines with a few curved ones. If the foundation of your layout is square and rectangular, bring in accents such as circular rugs, rounded vases, or plush barstools. 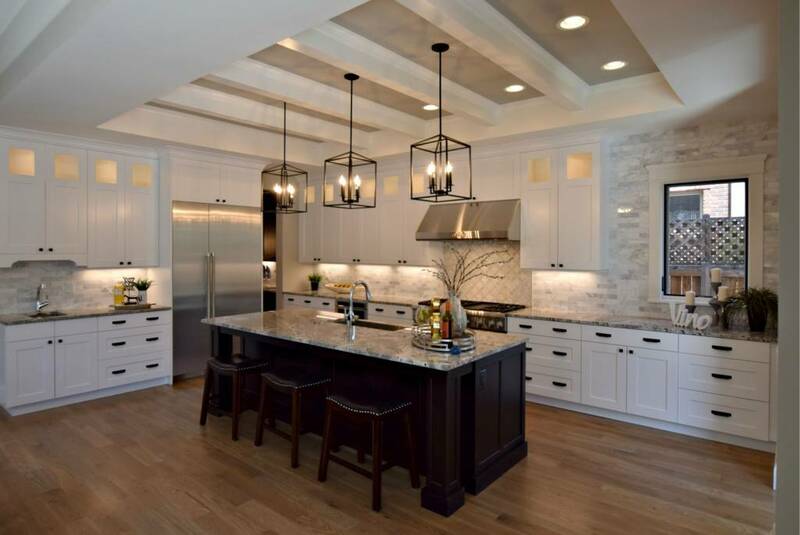 Aptly-placed shapes in the backsplash, lighting fixtures and accent pieces will harmonize the details into a cohesive, pleasing place for you to cook, socialize, and unwind in.